The 70-200mm focal range on a full-frame camera is one of the most popular. It finds a place in the kit bags of almost of types of photographers and is therefore a key battle ground not just for the main camera/lens manufacturers, but also the third party manufacturers like Sigma. By offering a 50-150mm lens for APS-C cameras, they provide approximately the same focal range as a 70-200mm while being able to tailor the lens specifically for better performance. Featuring an APO lens, Sigma’s HSM autofocus motor, internal focusing and a four-stop optical stabiliser, the handling, ergonomics and image quality should be high. To find out, the DxOMark labs have tested both a Nikon and Canon version. 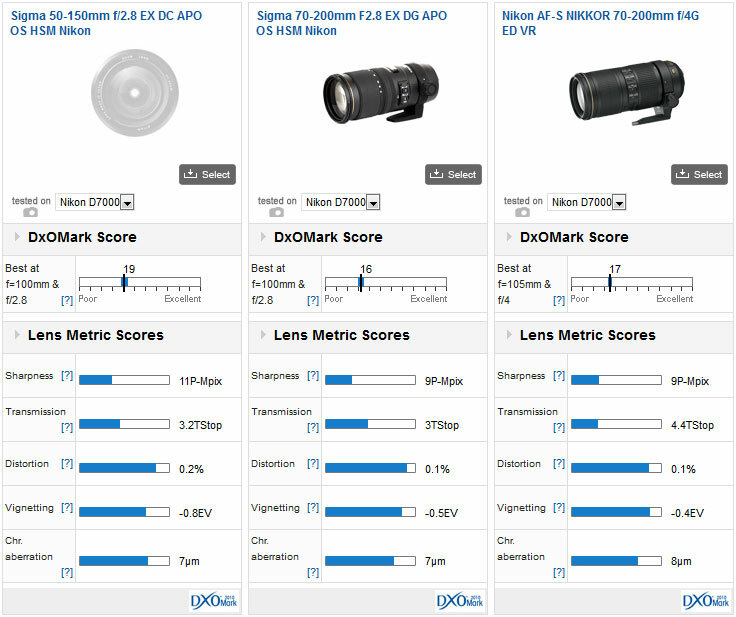 The Sigma 50-150mm lens performs equally well on both Canon and Nikon, managing 19 in overall DxO Mark scores. In terms of overall performance, both the Canon and the Nikon version of this lens perform well on their respective cameras, managing a DxOMark score of 19. In fact, looking at each of the scores in turn, whether mounted on Canon or Nikon cameras, this lens performs very well right across the board, with high transmission levels, minimal distortion, very acceptable vignetting and not much chromatic aberration either. For a third party lens, this is quite impressive and is even more amazing given the relatively reasonable retail price of $1000USD. It actually makes this lens look like very good value for money based on the performance levels offered. With a retail price of $1000 USD, the Sigma 50-150mm lens out-performs many other lenses in this category, even those with price tags substantially higher. The reality is that it is unlikely you will choose a camera system based on the performance of this lens, so comparing between these two on Canon and Nikon is not likely to help, though for the curious, you will note that the Canon scores are either equal or fractionally higher than the Nikon scores, though this is almost entirely down to the differences in the cameras rather than any inherent difference in the lenses for each mount. Putting the Sigma 50-150mm lens up against even very expensive models shows just how well it performs. Being that this focal range is so well respected, there is strong competition both from main manufacturers and other third party lens builders. The Sigma and Tamron manage a DxOMark score of 19, beating Canon’s EF70-200mm f/2.8L II IS USM lens, which performs a DxOMark score of 17. 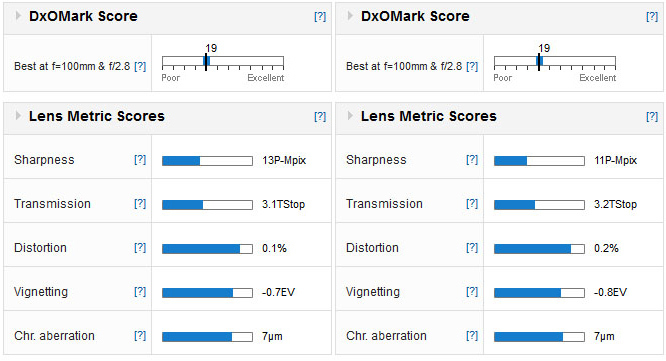 Despite being older than the Tamron lens, the optical design of the Sigma shows through to record the highest sharpness score at 13P-Mpix, while the Tamron and Canon both manage 12P-MPix. Unsurprisingly at these focal lengths, all three lenses show essentially homogenous sharpness levels across the frame, with no drop-off in the corners. 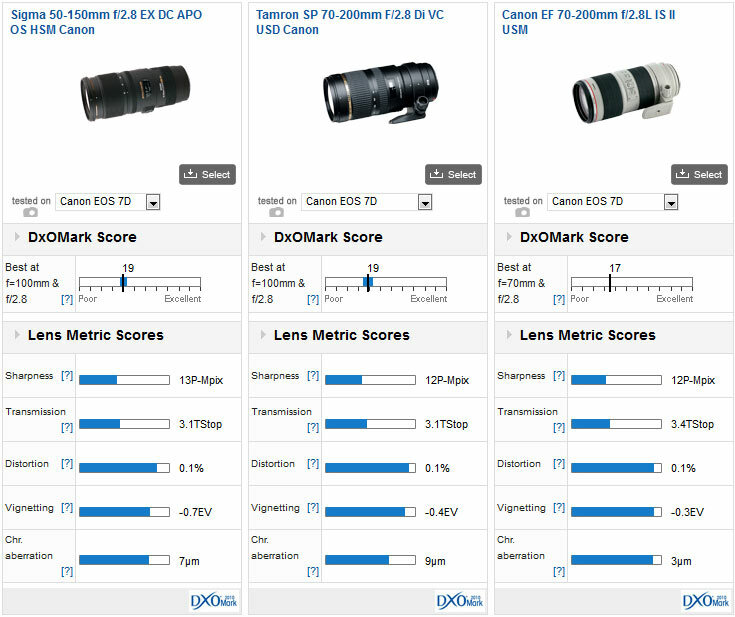 Looking at the transmission results, the Sigma and Tamron are equal, while the Canon falls slightly behind, scoring 3.4TStop to the others 3.1TStop. Equally, for the distortion scores, there is almost nothing present, with all three lenses scoring 0.1% – essentially nothing you’ll ever likely notice in the real world. In the vignetting test, the Sigma is actually the worst of the three, scoring -0.7Ev to the Tamron’s -0.4Ev and the Canon’s test-topping -0.3Ev. The Chromatic aberration tests again see the Canon coming out top with 3μm while the Sigma sits in the middle on 7μm and the Tamron is bottom with 9μm. In the real world, anything under 5μm is unlikely to be visible, and certainly not in final prints. Within the Nikon fit group there is also strong competition, not least from Sigma’s own 70-200mm EX lens. 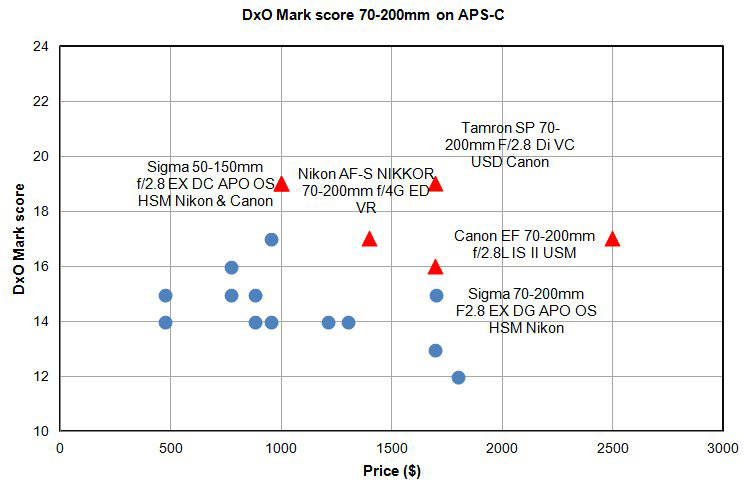 Once again, the Sigma 50-150mm lens top scores in the overall ranking, beating both the Nikon 70-200mm f/4G ED VR (DxOMark score of 17) and the Sigma 70-200mm f/2.8 EX DG APO OS HSM (DxOMark score of 16). It’s the sharpness scores where this main difference is seen, with the 50-150mm lens managing 11P-MPix to the 9P-MPix of the other two lenses. Across the frame, all three lenses are even as well, with sharpness reaching right out to the corners. In the transmission tests, all three lenses score well relative to their stated maximum aperture, with the Sigma 70-200mm just beating the 50-150mm. Distortion scores are all about equal too although in the vignetting tests, the 50-150mm does fall slightly short of the other two lenses, only managing -0.8Ev compared to the -0.5Ev of the Sigma 70-200 and -0.4Ev for the Nikon. The Chromatic aberration scores are all very similar too, with both Sigma lenses scoring 7μm and the Nikon lens scoring 8μm. As long as you’re using an APS-C sensor camera, it doesn’t matter which system you use, the Sigma 50-150mm f/2.8 EX DG APO OS HSM lens performs equally well on Canon and Nikon cameras. 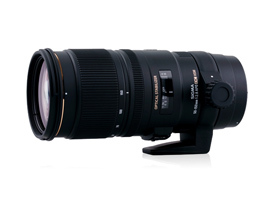 Considering the price, it offers high performance and good value for money and is an ideal solution to achieving the 70-200mm focal range rather than using a nominal 70-200mm lens that, that when used with APS-C cameras becomes more like a 105-300mm lens. In addition, the optical stabilizer and Sigma’s fast – and quiet – HSM focusing keeps the handling and performance levels high. And the addition of internal focusing helps with balance in the hand when shooting. The close focusing, down to 80cm, is also welcome for anyone who likes shooting close-up images.